The base of the artwork is the Penrose-tiling. Itself the structure is invisible, some motives are in positions according to the tiling. I put wave-sources (transmitters) to the half-section of the shapes' sides. I accounted the wave-interference for a water-like liquid. The amplitude of the waves is represented as different tones. The damping constant were accounted that the sides of the shapes can be fit to each other. 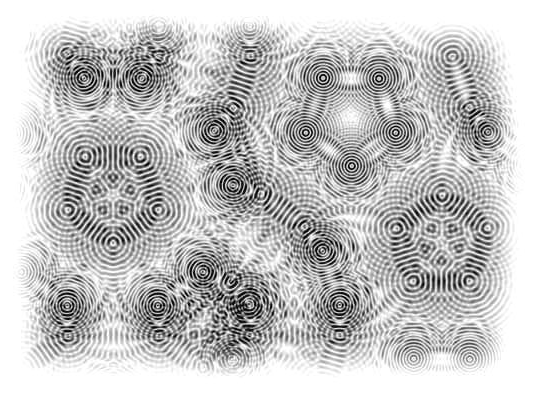 So the shapes construct a field where the wave-sources placed in a non- repeating order.